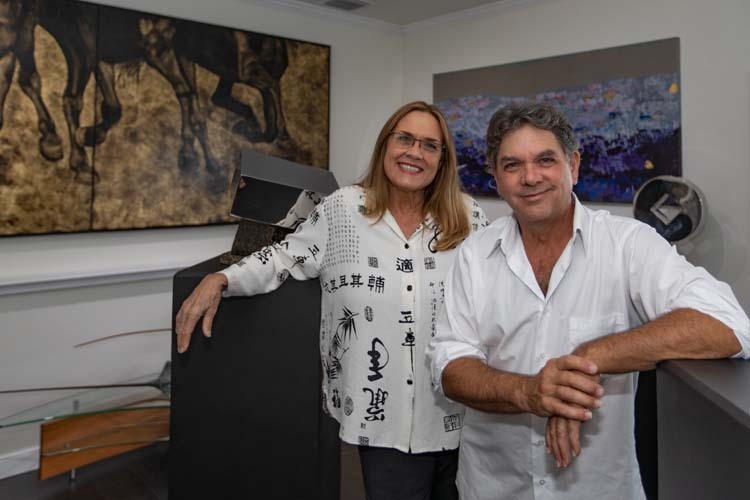 John Ryan and Amy Dyson have spent a lifetime devoted to exploring the arts and have recently opened One Zen Place to share their multiple talents with others. It’s a fitting undertaking for the married couple, who settled in Vero Beach roughly eight years ago. In an intimate, salon-style setting, Ryan, an accomplished pianist, composer and lyricist, entertains the audience with his music while Dyson, an experienced artist, creates a visual accompaniment. Adding a hint of mystery to the venture, the music/art studio is located off the beaten path. But despite that, the concept has already been well-received; the salon is full on most evenings. The pair introduced their Friday night soirées this summer with a series of Summertime Blues performances. They kicked off the series with Ryan tickling the ivories of a Bösendorfer Gustav Klimt piano, playing classic blues interspersed with some of his original compositions. Klimt’s exquisite “Woman in Gold” is reproduced on the inside of that piano’s lid, which segued into Dyson’s showing and discussing the works of Klimt. The Atlantic Music Center in Melbourne provides Ryan with a different piano to use every few months. That interaction is part of the fun. Ryan gives a history of the genre du jour and the highlighted musical artists, intermittently interrupted by Dyson, who adds to the background history, demonstrates art techniques and creates pieces in tune with Ryan’s music. One evening former astronaut and retired U.S. Navy Capt. Winston Scott was in the audience. A talented musician, he just so happened to have his trumpet with him and, to everyone’s delight, joined in for a few tunes. By day One Zen Place is a working studio and gallery. Ryan spends his time writing and composing while Dyson explores and creates her vision, as evidenced by the eclectic array of artwork on display in the gallery and the diverse mix of pieces in various stages of completion around the studio. “One thing this place has offered us is freedom, as artists, to be able to do the things we want to do. To spread our wings and have a platform to do what we want,” shares Ryan. Ryan began playing the piano at a young age; undeterred even after his piano teacher told his parents they were wasting their money. He began performing publicly at age 13 as a church organist for the whopping sum of $5 per Mass. He is predominately a self-taught musician and attributes his natural ability to genetics. His father was a classically trained pianist, as well as a Pentagon cryptologist. Ryan’s family moved to Melbourne when he was in high school, after which he became a firefighter for the City of Melbourne. Throughout his 25 years of service, he continued with his music, honing his skills while performing along the east coast of Florida as a solo performer. Locally he is a popular favorite country clubs such as The Moorings, John’s Island, Grand Harbor, Oak Harbor and Orchid Island. After putting herself through college as an advertisement model, Dyson eventually decided she preferred being behind the camera, doing whatever she needed to do to further a career as a photographer, before eventually exploring other avenues. While shooting a show at the National Gallery of Art, Dyson rediscovered the Natural History Museum and ultimately changed the trajectory of her work. After becoming fascinated with prehistoric art, she began questioning the way the Upper Paleolithic paintings in the Caves of Lascaux in France, which had been closed since 1963, were depicted in various texts. She wrote numerous letters to the French Ministry, which eventually agreed to look into 40 of the 200 depictions she had mentioned. Six months later, the ministry contacted Dyson, inviting her to visit the caves and consult with them regarding the paintings. In the end, Dyson was proved correct, resulting in the reclassification of 250 of the cave drawings. Dyson does a lot of commission work and is always in the midst of a variety of projects. Currently in the works are a series of composer paintings in the style of Rembrandt, Solo Stones (cairn rock sculptures to be used for neuroscience-based meditation), Enso (a Japanese art form created with a single brushstroke), Miksang (a form of contemplative photography), Sumi-e (Japanese ink painting), and prehistoric art designs. There are also sculptures of marble, wood and metal she designs and commissions out to her protégé, a professional welder who previously worked on the NASA shuttle platform. Although raised as children not far from each other in Maryland, the couple didn’t meet until Dyson flew to Melbourne to conduct an art appraisal. Dyson heard Ryan playing at a restaurant and decided that he would be the ideal person to compose the music for several animated films she had written. Now, the couple’s relationship has become deeply rooted in the arts, each finding inspiration from the other’s work. “I’ll hear him start playing and I’ll see it on the canvas,” says Dyson. “The Piano Man,” a musical comedy Dyson has written, is based on some of the comical events of Ryan’s 35-year career behind the piano. They eventually plan to share the entire process, from writing the songs to casting the play, through an interactive experience at One Zen Place. Through October, Ryan and Dyson will host evenings featuring different themes each week – from prehistoric art to the music of the late Aretha Franklin. In November they plan to unveil “Piano Night Live,” which will be live-streamed at OneZenPlace.com for folks who want to watch from the comfort of their own homes. The possibilities are endless, they say, envisioning One Zen Place as a blank canvas to be filled with new experiences. Future performances will include sand animation, guest singers, jazz trios and possibly even working on paintings while hanging from aerial silks. One Zen Place is located at 4005 43rd Ave. For more information, visit onezenplace.com, johnryanpiano.com or amydyson.com.